Welding is the most common method of joining metals in industry today. When welded, two pieces of similar metals are fused together by the use of heat, pressure or both. Once completed, the welded joint is as strong as or stronger than the pieces from which the joint is formed. Impact, penetration, harmful dust, smoke, fumes, heat and injurious light radiation are all potential hazards associated with welding. Welding “smoke” is a mixture of very fine particles (fumes) and gases. Depending upon what is being welded, many of the substances in the smoke can be extremely toxic. The intense heat of welding and sparks can cause burns. Eye injuries have resulted from contact with hot slag and metal chips. The intense light associated with welding can cause eye damage. Ultraviolet light from an arc can cause “welder’s flash” and also skin burns. There is also a danger of electric shock. If combustible or flammable materials are nearby, the heat and sparks produced by welding can cause fires or explosions. The use of compressed gas cylinders poses some unique hazards to the welder as well. Elimination: Eliminating the hazard, or physically removing it, is the most effective hazard control, such as eliminating welding. Substitution: Involves replacing something that produces a hazard (similar to elimination) with something that is less hazardous, such as replacing the base welding metal with something less toxic. 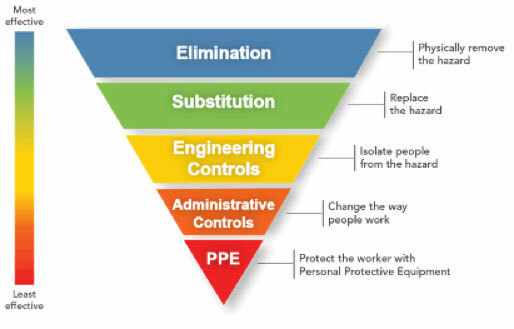 Engineering Controls: Engineering controls do not eliminate the hazard, but rather isolate people from the hazard, such as local ventilation at the source of the hazard. Administrative Controls: Administrative controls change the way people work. Examples include procedural changes, employee training and installation of signs and warning labels. Personal Protective Equipment (PPE): PPE is the last control and is worn to minimize exposure to a variety of hazards. PPE is considered the least effective means of controlling hazards. Examples associated with welding are respirators and flame-resistant clothing. Gas welding: Two metals are joined by melting or fusing their adjoining surfaces. This is done by directing a gas flame over the metals until a molten puddle is formed. The energy for gas welding comes from the combustion of a fuel with oxygen or air. A few of the most popular fuels are acetylene, MAPP gas and hydrogen. Since gas welding is slower and easier to control than electric arc welding, it is often used in applications such as general maintenance work, brazing and soldering. Arc welding: Two metals are joined by generating an electric arc between a covered metal electrode and the base metals. Heat is produced by the arc, which in turn, melts the metal and mixes the molten deposits of the coated electrode. The arc energy is provided by a power supply unit that furnishes direct or alternating current. The electrodes carry the current to form the arc, producing a gas that shields the arc from the atmosphere, and add metal to control the weld shape. When an arc is struck using a coated electrode, the intense heat melts the top of the electrode. The drops of metal from the electrode enter the arc stream and are deposited on the base metal. The equipment needed for electric arc welding is a power supply, electrode holder, ground clamp, protective shield and welder’s protective clothing. Eye and face protection: 29 CFR 1910.252(b)(2) states the requirements for eye protection. . Helmet, handshield, goggles and safety glasses or combination of these are acceptable protection in various applications. All filter lenses and plates must meet the test for transmission of radiant energy prescribed in ANSI/ISEA Z87.1-2015, American National Standard for Occupational and Educational Personal Eye and Face Protection Devices. According to OSHA 29 CFR 1910.252 (b)(2)(ii)(B), “Helmets and hand shields shall be arranged to protect the face, neck and ears from direct radiant heat from the arc.” Welding helmets with filter plates are intended to help protect users from arc rays and from weld sparks and spatters that strike directly against the helmet. They are not intended to protect against slag chips, grinding fragments, wire wheel bristles and similar hazards that can ricochet under the helmet. Spectacles, goggles or other appropriate eye protection must also be worn to protect against these impact hazards. When arc cutting and arc welding with an open arc, OSHA requires operators to use helmets or hand shields with filter lenses and cover plates. Nearby personnel viewing the arc must also be protected. Safety glasses with a Shade 2 lens are recommended for general-purpose protection for viewers. Protective clothing: 29 CFR 1910.252(b)(3) refers to the PPE Hazard Assessment in 29 CFR 1910.132. This requires the employer to identify the hazard and appropriate PPE needed to protect the employer from the hazards. Consensus standard ANSI Z49.1-2012, Safety in Welding, Cutting, and Allied Processes, provides guidance in the safe setup and use of welding and cutting equipment, and the safe performance of welding and cutting operations. Paragraph 4.3 provides more direction on clothing selection for welding tasks. “Clothing shall be selected to minimize the potential for ignition, burning, trapping hot sparks, or electric shock.” It also offers more specific selection guidelines for clothing, gloves, leggings, capes, sleeves, ear plugs, and caps. Paragraph 5.4 identifies two types of ventilation: natural or mechanical. Natural ventilation is considered sufficient when necessary precautions are taken to keep the welder’s breathing zone away from the air contaminants and when sampling of the atmosphere shows that concentration of air contaminants are below allowable limits. This system consists of fixed or moveable exhaust hoods positioned as near as practicable to the work that are able to maintain a capture velocity of 100 feet per minute to keep air contaminants below the allowable limits. The hood and housing may have to be repositioned by the worker to get maximum benefit from this means of ventilation. Hoods generally remove the fumes and contaminated air through ducting and filtration before being exhausted to the outdoors or recirculated into the work area. General mechanical ventilation may be necessary in addition to local forced ventilation to make up for the air that is being lost. This system is generally made up of items like roof exhaust fans, wall exhaust fans, and similar large area air movers. This system is not usually a satisfactory way by itself to control contaminants in the breathing zone of a welder; however, it is often helpful when used in addition to local ventilation. Fumes and gases from welding and cutting cannot be easily classified. The quantity of fumes and gases is relative to a combination of the metal being worked, consumable material being used depending on the type of welding being done, contaminants in the atmosphere, and the area the welding is taking place in. Once these are all known personal air sampling can be done to verify the concentration levels of toxic fumes and gases. Q. How do I know what hazardous materials exist in the base metal including residual chemicals on the base metal or consumables like the gas or wire I may be using? A. Check the Safety Data Sheet (SDS). The suppliers of welding materials must provide a SDS or equivalent documentation identifying the hazardous materials, if any, used in welding and cutting products. Q. What are the storage requirements for oxygen and acetylene and other fuel gas cylinders? A. Oxygen cylinders should be stored 20 feet or more from fuel gas cylinders or separated by a noncombustible barrier at least five feet high with a one-half-hour fire resistance rating. A. MAPP gas is a product that was developed as a fuel for welding, brazing, cutting, flame hardening and metallizing operations. It has many of the physical properties of acetylene, but lacks its shock sensitivity, and therefore, can be stored and shipped in lighter containers. MAPP gas is the result of rearranging the molecular structure of acetylene and propane. It also has a very distinct odor so any leakage can readily be detected.